It’s got the best chipset in the house, a high-resolution display that looks gorgeous, latest Android out of the box, and a good enough dual camera… all packed in a very stylish and solid chassis. The Honor 8 Pro is nothing short of a fantastic flagship smartphone in 2017. The recently launched Honor 8 Pro is the beefed-up version of last year’s Honor 8. The Honor 8 was a well-rounded package, but the compact form factor and mid-range specifications didn’t really allow for the ‘flagship’ tag. Enter Honor 8 Pro. There’s larger display, top-of-the-line specifications, and Android Nougat out of the box, yet it is not just a sequel or an XL version. The sum of parts is definitely greater than the whole, and the Pro moniker doesn’t tell the whole story. On paper, the Honor 8 Pro checks all the boxes for a flagship smartphone in 2017, but does the form and function merit it being categorized along with more expensive flagship devices, and the mid-range ones like the OnePlus 5? Let’s find out in our comprehensive Honor 8 Pro review! The Honor 8 was one of the best-looking devices of 2016, and the Honor 8 Pro sure can take a shot at the crown once again. Honor 8 Pro sports a seamless metal unibody design that looks and feels solid, as well as premium. The blue variant of course is my personal favorite, and quite a head-turner. The Honor 8 Pro isn’t the thinnest phone around, but with just 6.97 mm in thickness, it manages to pack in a 4000 mAh battery. For a smartphone with a large 5.7-inch display, the thin borders and rounded edges aid the grip. No, one-handed usage is not ideal, as one would expect in a phone of this size, but the ergonomics are quite good and the weight distribution is on point. It doesn’t feel as heavy as the specifications sheet suggests (184 grams), but it’s heavy nevertheless. At the back, the dual-camera sits flush with the surface and the fingerprint scanner too looks neat. The antenna lines on the Honor 8 Pro actually accentuate the design. Unlike the glass panel of the of Honor 8, the Honor 8 Pro sports a matte finish that improves the grip and is visually pleasing. Of course, some people liked that glass body, but it was a fingerprint magnet and quite slippery. The latter would’ve become worse in a smartphone of this size and weight. Overall, the Honor 8 Pro is a stylish device with a dependable chassis and stands out in the sea of similar looking smartphones in the market. The Honor 8 Pro sports a 5.7-inch IPS display with 1440 x 2560 resolution. The Quad HD resolution and a pixel density of 515 ppi make for a terrific display. The display is sharp and the colors are vivid. The contrast ratio is top-notch as well, and while the display is a tad reflective, sunlight legibility is pretty good. The display on the Honor 8 Pro offers a maximum brightness of 560 nits, which is brilliant. The black levels are deep and while there’s a blue tint on white, it’s not too noticeable to the naked eye. The Honor 8 Pro has a 2.5D curved glass which offers a nice swiping experience across the large display. There’s Corning Gorilla Glass 3 protection as well which will keep scratches at bay and prevent shatters to a certain extent. The Quad HD IPS LCD panel on the Honor 8 Pro is one of the highlights of the device, but the obvious flip side to a higher resolution display is the bigger strain on the GPU and a hit on the battery life. Powered by Huawei’s top-of-the-line SoC, Kirin 960 with Mali-G71 MP8 GPU, the Honor 8 Pro packs in 6 GB of RAM. Developed by HiSilicon, Huawei’s in-house chipmaker, the Kirin 960 chipset is one of the most powerful smartphone chips out there and does well to take on the Exynos and Snapdragon ones in benchmark tests. The Honor 8 Pro is a snappy performer that can handle aggressive multi-tasking as well as gaming without breaking a sweat. The generous RAM helps in fluid performance and there are literally no lags or stutters, as it sails through nicely as a daily driver. The device also does a good job at staying relatively cool even when stretched. My only grouse with the Honor 8 Pro is its loudspeaker performance. It sports a single speaker at the bottom, which is almost a letdown, and the average audio output disappoints. The Honor 8 Pro packs in a 4,000 mAh battery, and thanks to some great software optimizations, the phone can easily give you a battery life of two days. An hour of charging every day, and you could chug along nicely without getting anxious about running out of charge. The phone supports quick charging with the bundled 9V/2A charger, and it helps charge to a third of the battery capacity in 30 minutes and from 0 to 100% in under two hours. A large display with 1440p resolution is expected to impact battery life. 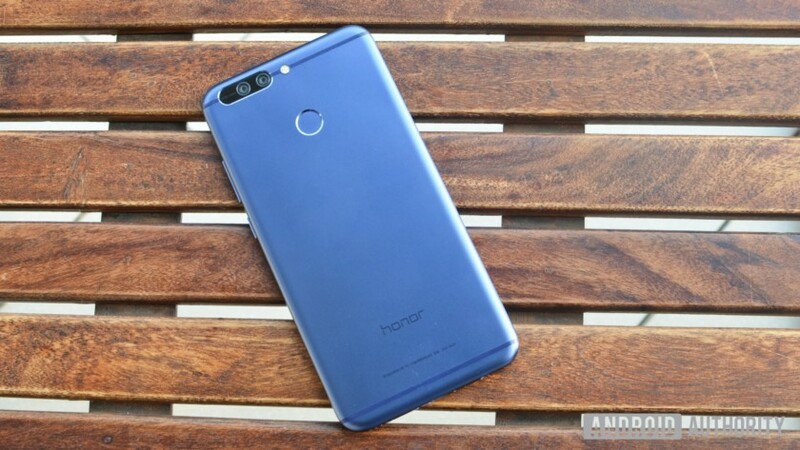 However, Honor has done well to pack a large battery and impressive optimizations under the hood. Even as a heavy user, I could manage a battery life of over a day. Also, the GPU needs to push all those pixels to the Quad HD panel. There’s of course a performance delta, but the solid internals on the Honor 8 Pro wouldn’t let that get in the way. All in all, the Honor 8 Pro stands tall in the performance race and is clearly a champion when it comes to battery life. The Honor 8 Pro features a hybrid SIM slot, so you can either use two nano-SIMs or one SIM and one microSD card. A lot of multimedia hoarders who use two SIMs don’t usually like this arrangement, but the Honor 8 Pro packs in a generous 128 GB of internal storage and not many people would care for memory expansion anyway. While the Honor 8 Pro sports a USB Type-C port at the bottom, yet oddly, the Type-C interface only supports the older USB 2.0 standard instead of USB 3.0 or 3.1. Most people though wouldn’t really care about it. Of course, OTG is supported. The Honor 8 Pro has a rear-mounted fingerprint sensor and it works quite well. Rarely did the sensor failed at authentication, and it works across 360 degrees – your fingerprint is recognized regardless of its position on the sensor. The rear camera on the Honor 8 Pro features a dual camera setup. There’s no Leica branding this time around, but Huawei was one of the first in the dual-camera game and has put out several devices with this feature already. The dual camera setup boasts of one RGB sensor and another monochrome sensor – both 12-megapixel ones with f/2.2 aperture. And there’s a dual-tone LED flash. Both sensors work in unison to produce detailed photos with higher dynamic range. The RGB sensor processes all the color information while the monochrome sensor extracts the details from the shadows as well as highlights. While the Honor 8 and Honor 8 Pro have identical camera setups, the shutter performance on the latter and the image processing is much better owing to the faster processor and all that extra RAM. The Honor 8 Pro takes some great shots. The colors are beautiful without looking over-saturated. In daylight, the photos captured have a very good dynamic range with true-to-life color reproduction. The focusing too is pretty quick, except sometimes in close-up shots. One of the primary advantages of the second sensor is improved low-light performance. The Honor 8 Pro relies on the monochrome sensor for capturing more light. Even at night time, the Honor 8 Pro manages to take some great shots without much noise and high level of resolved details. And of course, the two sensors work well to create an optical background defocus effect, popularly known as bokeh. The camera on the Honor 8 Pro manages to capture the depth of field quite realistically. It’s top-notch and one of the best in the business. Unlike the Honor 8, thankfully, the Honor 8 Pro has a dedicated monochrome mode that allows you to use the monochrome sensor to its full extent. This enables you to capture proper monochrome shots (not just black & white) with high level of detailing, contrast, and sharpness. While most people enjoy clicking portraits or photos with nice bokeh effects with a dual camera setup, I quite like to snap dramatic monochrome shots. With the Honor 8 Pro, the daylight shots are impressive with brilliant contrast and great amount of resolved detail. The low-light ones too are striking. The 8-megapixel front shooter on the Honor 8 Pro comes with a f/2.0 lens and manages to capture quite detailed selfies even indoors and in low-light, like when you’re out for dinner with friends. There’s of course the beautification feature which masks blemishes on your face, if beauty is just skin-deep for you. The Honor 8 Pro offers 4K video capture at 30fps. While the captured videos are sharp and colors look just fine, they lack the details. The camera app on the Honor 8 Pro also offers RAW shooting mode as well as a manual mode so you can granularly configure focus, shutter speed, ISO, and other settings. Out of the box, the Honor 8 Pro comes with Android 7.0 Nougat with EMUI 5.1 on top. Huawei’s proprietary layer – Emotion UI – has matured well from its previous generations and has comprehensive under-the-hood tinkering that boosts overall performance. According to Huawei, almost 90% of core operations on the phone can be completed in three steps, and I can safely say that the claim is not misplaced. The company claims that there are small, but very useful things, like improved mis-touch detection or better dictation algorithms. Then there’s the new Ultra Memory algorithm that learns from your app habits and speeds up app launch/resume by keeping what you consider important in the RAM. There’s also Ultra Response that allows for faster touch response and supports predictive finger tracking. Huawei intends to use advanced machine learning to catalog and predict user behavior and allocate system resources accordingly for a better overall experience. SmartPower 5.0, the company’s intelligent power management platform, is an example of the same as it works towards improving battery efficiency. While EMUI didn’t have an app-drawer like most Android skins from Chinese OEMs, but with EMUI 5.1, Huawei now offers the option between the usual ‘all-apps-on-the-deck’ one or a two-tiered interface with a homescreen and an app drawer. There’s also a Simple UI that’s useful for elderly or visually impaired users. The Phone Manager app is the one-stop shop for all phone management (d’oh!) tasks. There’s a one-touch optimization button as well as a virus scanner powered by Avast. The Power Manager offers two battery savings mode – Power saving and Ultra power saving. EMUI 5.1 is jam-packed with features all over – both in the UI as well as under-the-hood. While it offers a clean and intuitive user experience on the surface, there’s much more behind the scenes. The Honor 8 Pro comes in a box that can be turned into a Google Cardboard-style VR headset. There are two VR apps pre-installed on the Honor 8 Pro – Jaunt VR and Cardboard. The VR headset is easy to assemble but it’s just a gimmicky one, and not something you can use to indulge in VR extensively. The lenses are pretty good, but it’s hard to hold it comfortably and find the right viewing angle. But of course, it is good way for you to try VR apps and games, and if it works for you, maybe buy a third-party VR headset. The Honor 8 Pro is nothing short of a fantastic flagship smartphone in 2017. Launched in the UK in April for £474.99, and now in India for ₹29,990 ($463), the Honor 8 Pro has managed to squeeze in a well-rounded flagship device in mid-tier price segment. In India, the price is lower than that of OnePlus 5, and while the latter has gotten all the buzz in last few months, the Honor 8 Pro might just spoil its party. While Huawei and Honor have been slowly and surely getting a foothold in the Indian market, the company was always in the hunt for a game-changing device that captures not just the mindshare, but also flies of the shelves. Looks like, the Honor 8 Pro might just be that. It’s got the best chipset in the house, a high-resolution display that looks gorgeous, latest Android out of the box, and a good enough dual camera… all packed in a very stylish and solid chassis. There’s not much to complain, really. The Honor 8 Pro is nothing short of a fantastic flagship smartphone in 2017.